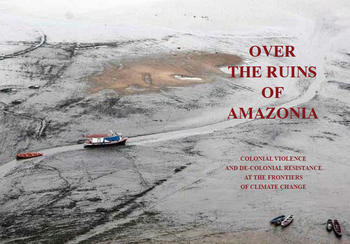 Presented by UC Santa Cruz's Center for Creative Ecologies, this series of talks investigates the current meanings of climate justice for communities from California to the Ecuadorian Amazon. Featuring Valentin Lopez (Amah Mutsun Tribal Band), Flora Lu (UC Santa Cruz), Néstor L. Silva (Stanford University), Leila Salazar-Lopez (Amazon Watch), Andy Szasz (UC Santa Cruz), T.J. Demos (UC Santa Cruz), and Paulo Tavares (Centre for Research Architecture, Goldsmiths, University of London/Pontificia Universidad Católica del Ecuador). Climate justice is built on the realization that addressing environmental change must be accompanied by attentiveness to structural inequalities, and that any solution must prioritize socio-political and economic justice and include the participation of those most vulnerable to environmental impacts. It raises ongoing questions of political-ecological urgency for artists and activists alike. Parking at UCSC is by permit only. More information about visitor parking. This series of talks is organized by T.J. Demos and the Center for Creative Ecologies at UCSC, Climate Justice Today responds to these pressing questions related to how we address the social, economic, and ecological impacts of our changing environment, and what political recourse and sites of agency remain. Climate Justice Today is generously sponsored by UCSC’s Arts Dean’s Fund for Excellence, UCSC’s Colleges Nine and Ten, and UCSC’s Institute of the Arts and Sciences.